its cute, just as described, my daughter loves it. It's cute for a child or teen the look is girly for either age group.It does make the room pop with the colors it has. We like it since we were looking for something for the spring time, and this is definitely something springy. its Cool and fun. The bed in a bag includes a comforter, coordinating sham, and pillowcase, while the full and queen sets include an additional pillowcase and sham. The reversible bed in a bag also includes flat and fitted sheets and a bed skirt with 14-inch drop that lends a pretty style. Each piece in the bedding set is made from microfiber to ensure maximum comfort. You can easily maintain this reversible bed-in-a-bag set by popping it into the washing machine. I just purchased this Bed in a Bag set. It states that it is 8 piece (I purchased the full size) which includes sheet set, flat, fitted & 2 pillow cases, comforter, 2 shams and bedskirt. However upon receiving it the set DOES NOT include the bedskirt. It is clearly stated on the packaging 7 piece Bed in a Bag set. I guess I will have to purchase a bedskirt separately. I was hoping to have everything included, as advertised, so I didn’t have to find a bedskirt with a 14” drop as was stated on the description, to complete the set. Disappointing. 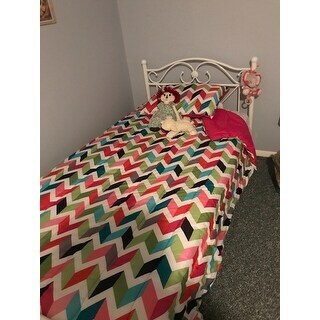 Granddaughter was very excited with the beight colors and design of the comforter and sheets. Bought this set to redecorate my 5 year olds room, she loves it! The colors are bright just like in the pictures and the sheets are very soft. Great bedding set! My daughter loves her new comforter set😊. She said there colors are so bright and beautiful. And it’s comfortable and warm. I brought this for my teen daughter and she absolutely love it. The colors are very vibrant, and the set bedside fitted, as well comfortable as she stated. all my grand kids loved their bed sets. I liked the quality of the sets and the grandgirls loved the colors. Which were exactly like the picture on the website. Good quality bedding set for my daughter!! so colorful and bright! bought this as a gift and she loves it! it's nice quality, super value, and really pretty. perfect for a girl or woman who isnt into fluffy pink stuff, or any one who wants a vibrant, modern look. I would buy it again! Love the colors. Goes great with white bed. The fabric is silky and so soft! I loved it! Meets every expectation! My daughter loves it. The perfect fit for her bedroom. I purchased this comforter for my friends daughter she picked it out and is absolutely in love with it. It looks just like the picture the shipping was fast and the price was amazing. I’m happy with my purchase. "Can you tell me what color the Bed Skirt is? There is no mention of that, nor a picture showing the Bed Skirt." I apologize for the confusion, this set does not include a bedskirt. We are working on having the description updated. An off white color maybe ivory. It covers things under my bed very well.